The school life expectancy is the number of years of schooling a child of school entrance age can expect to receive. It is calculated as the sum of age-specific enrollment rates for the specified levels of education. The UNESCO Institute for Statistics (UIS) provides data on the school life expectancy for the following levels of education: pre-primary, primary to secondary, primary to tertiary, and tertiary. Figure 1 displays the average school life expectancy for primary to secondary education in eight geographic regions - Arab States, Central Asia, Central and Eastern Europe, East Asia and the Pacific, Latin America and the Caribbean, North America and Western Europe, South and West Asia, and Sub-Saharan Africa - and for the world as a whole. 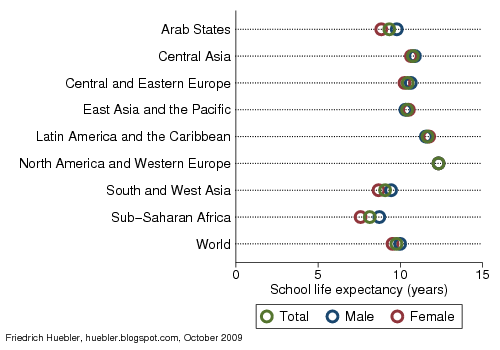 For each region, the total, male and female school life expectancy is shown. A high value for this indicator means that school enrollment rates as well as retention rates are high and that children are likely to spend a high number of years in formal education. The values plotted in Figure 1 are also listed in Table 1. In addition to the school life expectancy in years, Table 1 lists the gender parity index for each region. The GPI is the ratio of the female to male school life expectancy. Values below 1 mean that girls have a lower school life expectancy than boys, while GPI values above 1 mean the opposite. A GPI of 1 indicates gender parity. All data in Figure 1 and Table 1 were obtained from the UIS Data Centre and are for the years 2007 and 2008. Data source: UNESCO Institute for Statistics, Data Centre, October 2009. Children in North America and Western Europe have the highest school expectancy. On average, boys and girls alike can expect to spend about 12.3 years in school. In Latin America and the Caribbean, the average school life expectancy is 11.7 years. In three other regions children are also likely to receive more than 10 years of primary and secondary education: Central Asia (10.8 years), Central and Eastern Europe (10.5 years), and East Asia and the Pacific (10.4 years). In Sub-Saharan Africa (8.1 years), South and West Asia (9.1 years), and in the Arab States (9.3 years) the average school life expectancy is lower than in the other regions. Note: GPI is the gender parity index (female / male school life expectancy). Sub-Saharan Africa, the Arab States, and South and West Asia have not only the lowest school life expectancy, they are also the worst performers in terms of gender parity. As the graph shows, there is a relatively large gap between the male and female school life expectancy in these regions, with GPI values ranging from 0.87 in Sub-Saharan Africa to 0.92 in South and West Asia. On average, girls receive one year less education than boys in these three regions. In Sub-Saharan Africa, the school life expectancy is 7.6 years for girls and 8.7 years for boys. In the other regions, there is little or no difference between the school life expectancy of boys and girls. In Central and Eastern Europe, the GPI is 0.96, with a school life expectancy of 10.6 years for boys and 10.3 years for girls. North America and Western Europe have reached gender parity. In East Asia and the Pacific, and in Latin America and the Caribbean, the school life expectancy is higher for girls than for boys; in both regions, the GPI is 1.02. Compared to the beginning of the decade, the school life expectancy has increased in all regions, especially in Sub-Saharan Africa. However, the gap between the best- and worst-performing countries is still large. In addition, gender disparity continues to be a problem, especially in regions where the school life expectancy is low.